Re-opened and now called the 'Concho Lounge'. Why I don't know, as, as far as I can tell there is no connection between Spain and Newquay or why one would want to call your pub after the slang (in Spanish) for the dregs left in a glass or bottle.....oh well. No real ale on draft but a good selection of lagers. All redocorated and with a good selection of seating, pleasant bar staff, about as good as it gets in this town. Good pub, not as unwelcoming as it looks, reasonable service and competent/friendly staff. Haven't tried the outside area. 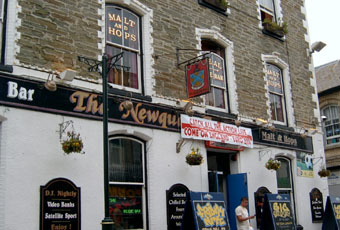 Another great pub in newquay. Good for a pre club drink, but also serves great food. Nice outdoor seating available but does get busy quite early.